This is post looks at UK specific citation places, but many will have sections for other countries. For pure US citation sources try here. Local SEO is a hot topic this year, as marketers are realising the traffic potential of a good local ranking in certain industries. 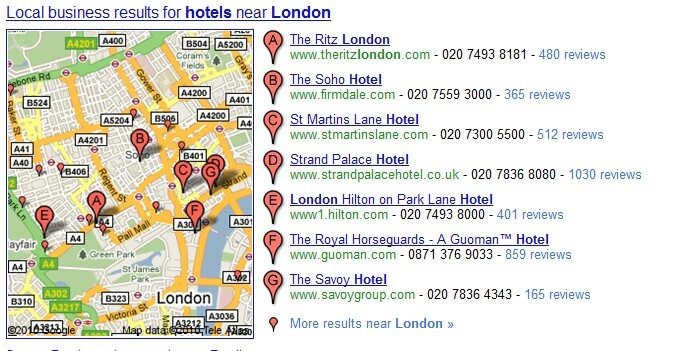 One industry where Local SEO plays a big role in search marketing is Hotels. 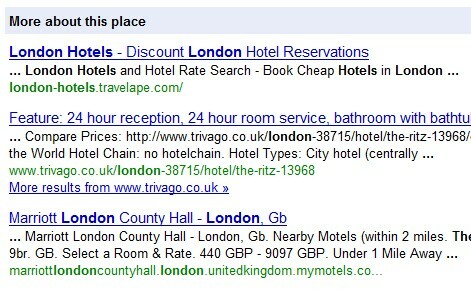 A search for ‘London Hotels’ will bring up this 7 pack of local listings, which are now getting more clicks than the organic listings below them: Google’s Local SEO algorithm has been greatly improved over that last year and listings are becoming harder to hijack and spam, though they still have work to do in pulling data for the reviews and citations: What are the main factors of Local SEO? You will find that Google will also pull in reviews from these sites and mix them up with direct reviews from Google Places users. Need Even More local UK Citation places?? Along with these top places to get listings you can also get address citations from many other authority sites, you just need to be a bit crafty sometimes ;). Some other places where I have seen address citations being picked up by Google Places are uk.answersyahoo.com, ehow articles, meetup.com and uk.loadedweb.com. If you are not sure whether you have listings in the top local directories, try David Mihm’s new UK local SEO tool which will search for your listings. SEOmoz Whiteboard Friday – SEO for Local Search from Scott Willoughby on Vimeo. If you think I have missed any good places for authority citations (or easy and quick citation sources), drop them in the comments below. If you are looking for a local seo service, please contact me. You sure Pete…just had a quick look and they seem ok to me. As well as these generic directories I always make an effort to source city or region specific citation sites as I am a firm believer that citations from these sites provide more authority to a business’s Google Places Page. Finally I always investigate the niche or sector I’m working in so for example estate agents… there are 10-20 property directory sites in the UK that list estate agencies and Google do scrape these sites. Again very relevant sites to target and they will provide that much needed trust for your business listing. Hi Andrew, thanks for dropping by and cheers for those other sites. Yep, freeindex turns up a lot in citations too, the pages can also rank OK in organic search results too. Great post – one of the most authoritative I have seen on this topic for UK businesses. For some of the above there is an additional social marketing value which makes listing on these sites an absolute must. For example, registered users of Yelp can link their Yelp accounts to their Facebook account. This allows them to “like” a business or service on both services – with “likes” appearing on their Facebook Wall thus making a contribution to word of mouth campaigns. Reviews on many of the above also contribute to customer acquisition. Thanks Geoff – Yep good point about the facebook ‘likes’ on Yelp. I think these will be really important when Facebook launches its internal search engine…I’m sure this is coming soon. Great post, thanks a lot. I found though that I got a LOT of telesales calls after submitting my site to these directories. People ringing up “to verify my listing” then try and sell me an enhanced one (fair enough) but also from companies that mentioned a couple of the above websites but were otherwise unrelated, just trying to sell me SEO services. Very annoying – obviously one or more of the above passed on my info. Will get cracking on some of the other suggestions. I had already followed David Mihm’s suggestions but there are many more on your list to work through. Great! PS – Web Design in Maidstone, Thomson Local offers a free listing. I have added one recently. Thank you for sharing this – it’s been one of my favourite reads of my day and I will definately be following your posts. Just one note though that the link to Infoserve has a typo (an extra http). Yes, this seems to be a very hot topic this year. I find the best place to find citations is in your competitors places pages. However, it is frustrating how long citations take to show in Google maps, and also how many business are earning citations through web pages that aren’t even citing them! I’ve seen some businesses earn citations just because their city is named on a website!